Dr Ashwini Natraj is a Senior Economic Consultant and core member of the Behavioural Economics team. She is responsible for managing, carrying out and delivering consumer and behavioural economics research projects for public and private sector clients. She has in-depth experience of applied behavioural economics including the design and delivery of experiments testing the impact of policy and information provision on cognitive biases, consumer behaviour and decision-making. 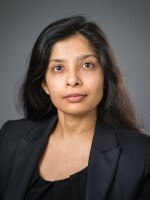 Her previous work has covered applications of behavioural science and experiments in the areas of e-commerce, price comparison websites for high-cost short-term credit loans, retail energy and electricity tariffs, consumer decision making when selecting a legal service provider, and behaviour relating to commercial and legal guarantees. Ashwini has a PhD in Economics from the London School of Economics, an MSc in Econometrics and Mathematical Economics from the LSE and a BSc in mathematics from St. Xavier’s College, Mumbai.